NOW ON SALE FOR $79,995 including a BACK TRACK all-aluminum, tandem axle trailer with brakes! All new for 2018 is this AWESOME, 2018 VP 25 Hard Top series. 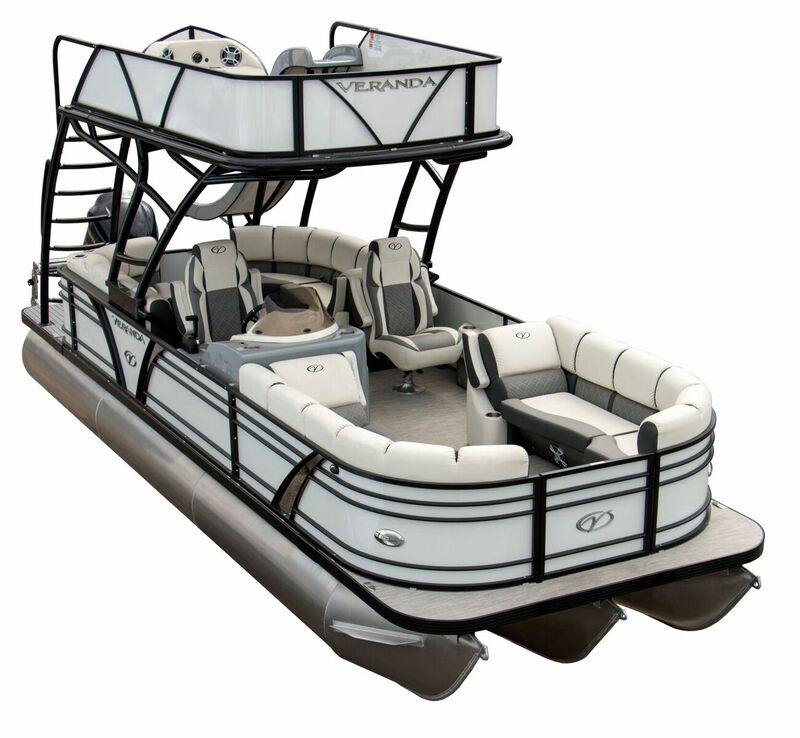 Standard features include an aluminum Interlocking floor (patented), vinyl flooring, 27" log triple pontoon, in-floor storage, lifting strakes, performance motor pod, hydraulic tilt steering, fiberglass console with vinyl wrapped dash, under console storage, raised helm platform with LED's, deluxe steering wheel, Simrad G07 GPS with digital gauge readout, horn with stainless grill, Bluetooth stereo with Clarion lighted speakers, LED interior lights, wood free seats with water management, premium VP pillow top seating, reclining deluxe helm seat, 4 chaise lounges, privacy room, stainless cup holders, portable armrests with cup holders, port captains chair cup holder tower, removable table, stainless docking lights, stainless fold down cleats, stainless navigation, anchor and docking lights, rear entry gate, stainless ladder, underwater light, under deck lighting, stainless panel accents, black powder coated hard top with slide, SeaDeck upper deck and swim platform, upper deck audio with 4 Clarion lighted speakers, 2 ocean tamer bean bag chairs, stainless steel prop and an exclusive Sure Seal snap-less boat cover. The boat comes loaded with equipment but we added a few additional options to it. Those are side keels, a bow filler seat, black powder coated rails, stainless steel gate handles and aluminum wheels on the Back Track aluminum, tandem axle trailer with brakes. 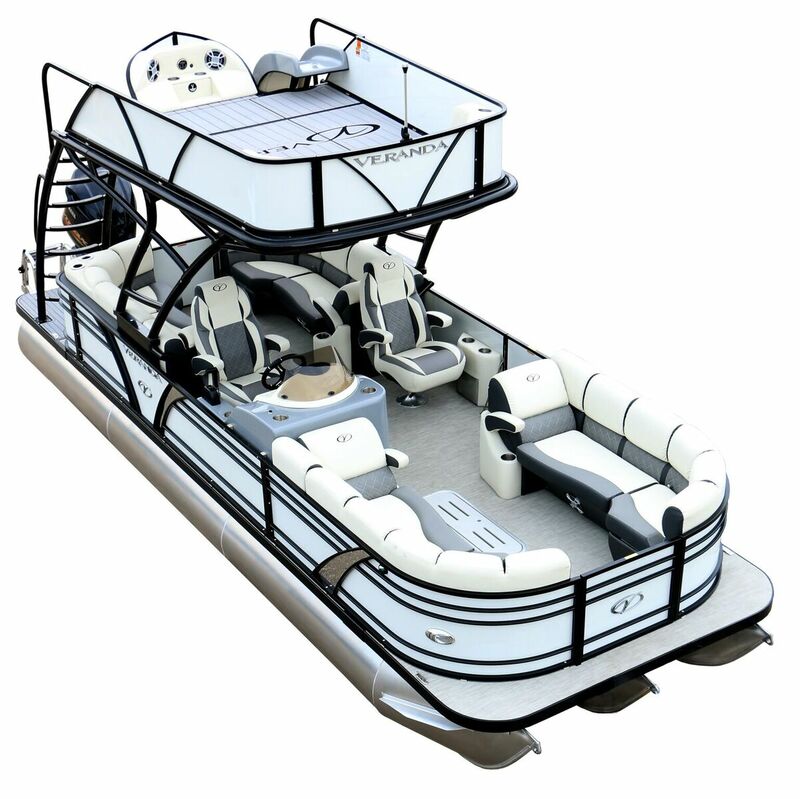 Boat color: Pearl White / Black powder coat rails / Saratoga gray / Slate interior.